I knew making Lighten Up Batman was going to be a challenge. And yes, I was right, it was a challenge. Through every single stage of production I was faced with seemingly insurmountable challenges. Every day brought a new set of problems I needed to overcome, a new issue I had never dealt with before. So in the face of such adversity I looked to the Dark Knight himself for inspiration, and thought, “What would Batman do?”. The answer was always the same, “Never give up, trust yourself, and find a way”. Once the scripts were complete, the first major challenge was the Batsuit. Although I knew that I wanted to draw a lot of inspiration from the Tim Burton-era suit (my personal favorite), I wanted everything in LUB to be original and one of a kind. With Gary's wardrobe being bright and colorful, I wanted my suit to be a dramatic contrast, keeping true to Batman. I worked closely with my art director on the design and creation of the suit, and it was a frustratingly fun, creative, and experimental process. One day things would seem perfect, and the next it could all come apart (literally). Despite that, we pushed forward. We worked together, took everything one step at a time, learned through trial and error, and we brought my vision of the Batsuit to life. The suit we created for the show was a labor of love, and I couldn't be more proud of it. The largest challenge of making Lighten Up Batman from a design perspective was the Batcave. Based on my ideas and the scripts, I knew that the cave would be integral to the show so it had to be something special. Like with the suit, this type of design presented a new and unique challenge for me. We tried several different ideas to get the look right, but for one reason or another we had to scrap each of them and start over. In the end, it was cinefoil (black matte color aluminum foil used for lighting) that gave the cave the exact look I wanted. By crumpling it up and stretching it back out, we were able to create great looking rock formations for the cave walls. Once we had the “how” figured out, the cave took shape, and another obstacle was overcome. High five -- Back to work -- On to the next thing. Now I presented those challenges and triumphs to give you a glimpse into what it was like to create a project like LUB. Despite all the issues and problems faced throughout the journey, I forged ahead. When I didn't know how to do something, I learned. When I was unsure if something would work, I tried. When I wasn't sure what materials to use or how to use them, I researched. I believe that filmmaking is about growing, testing yourself, and learning new skills. Lighten Up Batman was an amazing experience that did all of that and more. With that in mind, and without any further adieu, I proudly present the second episode of my web series. 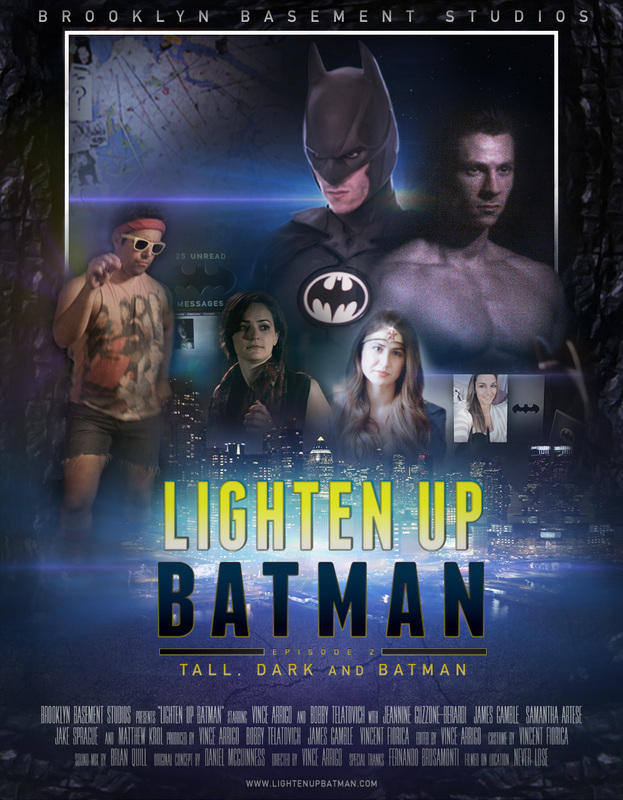 Lighten Up Batman: Tall Dark and Batman!